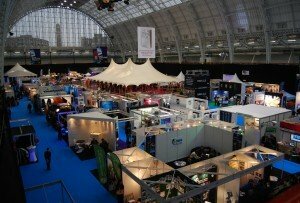 Having spent a couple of days last week at the Event Production Show talking to existing and potential customers it’s interesting to note down some of the common themes we are hearing and challenges people are facing around technology. 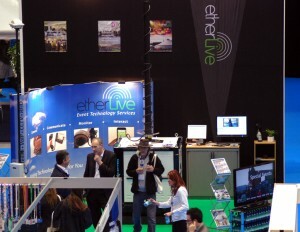 Underpinning many of the discussions I had was an increased focus on the importance of event connectivity. It has moved from a nice to have, through must have, to critical as more and more services rely on it. With that more organisers now understand some of the challenges in terms of capacity and performance and, for example, weaknesses such as ‘upload’ performance on ADSL and the problem with latency on satellite, which renders VPN and VoIP services nearly unusable. We are not locked to a single provider or service and can offer everything from BT lines through to satellite, WiMAX and fibre, depending on requirements, budget and time. Understanding what capacity is really required is a critical step in the process. The cost of connectivity remains a concern but there are a few ways to keep cost under control, firstly book early! The shorter the notice the less options there are, and at short notice services often need to be expedited leading to significant extra charges. Secondly consolidate, reduce the number of lines by using VoIP and use a proper managed network to share and control bandwidth effectively. Lastly look at longer term options – if you are going to be using the same site for several years it is often cheaper to install permanent connectivity rather than temporary services as the main cost is the installation, with the annual rental often much lower than the cost of reinstalling each year. We now do this for a number of customers and manage all the technical and paperwork aspects so that the service is available when needed. Another common comment was ‘we tried to use 3G but it was a disaster’. Running event connectivity on 3G is a highly risky strategy, at best it is likely to give poor and intermittent performance and more commonly during an event it is completely unusable, even when additional mobile towers have been placed on site. If an event needs connectivity then it needs managed connectivity, not ‘cross your fingers and hope’. The difference in cost between using a 3G approach and a basic professional set-up is not as large as people often think and there are many benefits. Over the last couple of years the interest in site-wide attendee Wi-Fi has increased significantly and that trend continued this year. Alongside the general desire to allow people to stay connected the other big driver is the use of smartphone apps. Providing an application at an event with no additional connectivity generally results in unfavourable reviews as the performance is poor. The good news is that in many cases extending Wi-Fi internet coverage to the public is not as big a problem as it may seem, provided it is done correctly using appropriate hardware and managed networks with features such as traffic shaping. There are various models for cost recovery including ‘hotspot’ type charging or advertising and branding. Integration of services is another key issue with production, ticketing, merchandise, bars and catering, security, etc. all having their own specific needs. Bringing all this together successfully requires experience and extensive IT knowledge. Making sure everyone is talking and sharing requirements is part of the service we provide so that you do not need to worry about the fact that the ticketing company require an onsite SQL database and a site-to-site VPN connection to a hosting centre you have never heard of! Event IT is it’s own specialist area, you wouldn’t dream of letting any old person run your sound system, provide power, operate ticketing or put up marquees, and the same is true of event IT if want a dependable service which meets your needs.